The abiding impression of Aude is of never-ending vineyards, for this is the land of Corbières, Minervois, Fitou and the delightful bubbly known as Blanquette de Limoux. In recent times, it has become the focus of attention dwelling on the history of a persecuted religious sect known as the Cathars; indeed, ‘Le Pay Cathare’ and the numerous ‘Routes du Pay Cathare’ are actively, and rightly, promoted by the local tourist offices. Dan Brown instigated a landslide of interest through the Da Vinci Code, but it is arguably Kate Mosse’s award-winning Labyrinth and its sequels, Sepulchre and The Winter Ghosts that make the history of this fabled land of troubadours, knights and blaggards come superbly and imaginatively alive. Almost at the centre of the département lies the two-part city of Carcassonne. The lower town – La Ville Basse – is built around the bastide of St Louis, built in 1260 to the customary chequer board pattern of these fortified settlements. There are over 300 in the south of France, and as well as meeting defensive strategies, they served to garrison and control the changing and feckless populations of the Middle Ages. Today, St Louis is consumed by the sprawl of modern Carcassonne, a bright, bustling place and one of the most-visited cities in the whole of Languedoc-Roussillon. Above the bastide, across the River Aude is the Upper Town, La Cité, the largest fortress in Europe, consisting of a central building, the Chateau Comtal, surrounded by a double curtain wall within which hundreds of people once lived. Today, there is a resident population of a little more than a hundred here, with access by the narrow Porte Narbonnaise, a crenellated redoubt built on a bridge across the moat. Wandering the floodlit streets of La Cité at night, after the clamour of tourists has subsided, is one of the great pleasures of Carcassonne. The regular layout of the lower town means that it is difficult to get lost: just keep turning left and you’ll probably find your friends wondering where you got to, still ensconced outside the café on the Place Carnot, one of the city’s most favoured meeting places, where markets are held beneath the gaze of a statue of Neptune, and the problems of the world are put to rights, at least for the next hour or so. 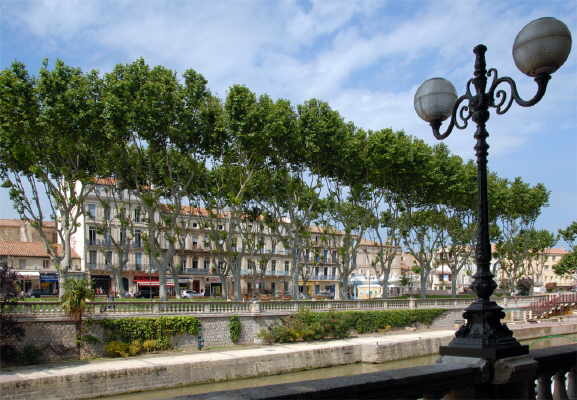 Walk up Rue Georges Clemenceau, and eventually you come to Pont Marengo spanning the Canal du Midi, just in front of the railway station. The département of Aude is sub-divided into five slightly amorphous regions. Facing out onto the Mediterranean is the Pays de la Narbonnaise, the littoral, a long sandy stretch of coastline backed by large lagoons and fronted by popular, modern holiday resorts like Narbonne-Plage and Gruissan. The focal centre here is undoubtedly Narbonne itself, a very easy-going and bright city at the heart of the wine-producing business. In its time, it has seen a Roman presence – parts of the Via Domitia are visible in the square in front of the Hotel de Ville – and a Visigoth dynasty. But the charm of the River Robine lined with mini-cruisers, the narrow streets and elegant boulevards make Narbonne a most agreeable and laid-back place. 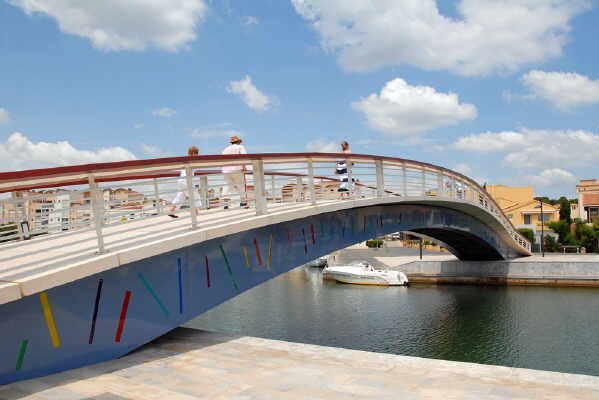 By contrast, Gruissan is something of an odd-ball. The old town of Gruissan used to be isolated in the middle of lagoons, and was an important point of defence for Narbonne. Today, the demands of tourism have thrown up hundreds of duplicated pastel-coloured apartments stacked like freight containers on some ocean-going ship, plus all the trappings of a wealthy marina and popular beach-side holiday resort. Inland from Pays de la Narbonnaise is the gently undulating wine country of Corbières and Minervois, where serried ranks of vine either spread across vast acres or are shoe-horned into the tiniest of corners. But at the southern edge of this region the land becomes contorted in the most engaging fashion. 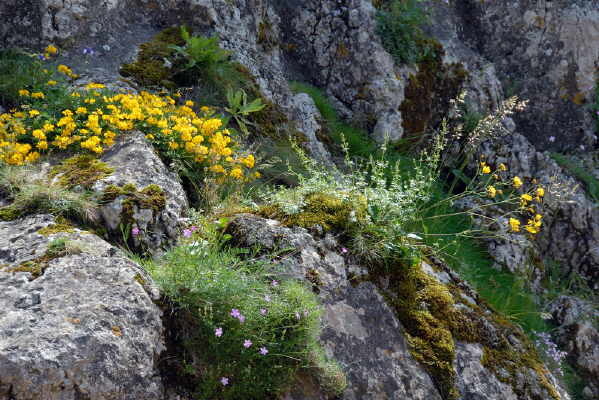 Vineyards still persist, but there is more of the rough garrigue countryside here, and a twisting, turning succession of gorges that lead in anything but a direct fashion to the mountain strongholds that made their stand long ago against the Cathar persecutions. 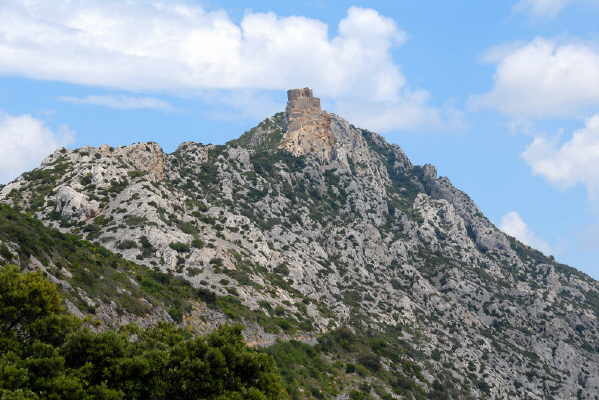 Quéribus, on the border with Pyrénées-Orientales, is accessible by a short and easy walk, while, within viewing distance, the much more complex Peyrepertuse blends so closely with the rocky upthrust on which it stands as to be indistinguishable from it at a distance. These huge fortified castles are astonishing just in themselves, without the pallor of religious ‘cleansings’: the drive to them traverses the most spectacular of intricate landscapes. Further west lies Pays de la Haute Vallée de l’Aude, a region that focuses on the town of Limoux, and the production of that delicious alternative to champagne for which the region is renowned. But further south, high above a superb landscape of farmland and mountains is a small, seemingly innocuous village, Rennes-le-Chateau. Perhaps surprisingly, given its modest size, this is a place with international renown, not only through the novel, Sepulchre, of Kate Mosse, but because of its notoriety as a place where a 19th-century priest is said to have found proof of a secret society established to safeguard the bloodline of Christ, the source material from which the Da Vinci Code was fashioned. The village is a delight, and a most pleasant place to mooch around not least because there is a rather excellent small restaurant here. The ‘secret society’ legacy persists, and it is mildly amusing (if you have nothing better to do) to assess the pro or con allegiances of those relating the story by the stance they take towards this so-called hoax. The truth is, no-one knows for sure, it being impossible to prove that something didn’t happen. Meanwhile, while sceptics, pedants, rumour-mongers, philosophers and assorted nutcases skate on the thin ice of truth and faith, the village very sensibly prospers, still considered by tourists to be packed with clues to an alternative view of religious history…if only we knew where to look! 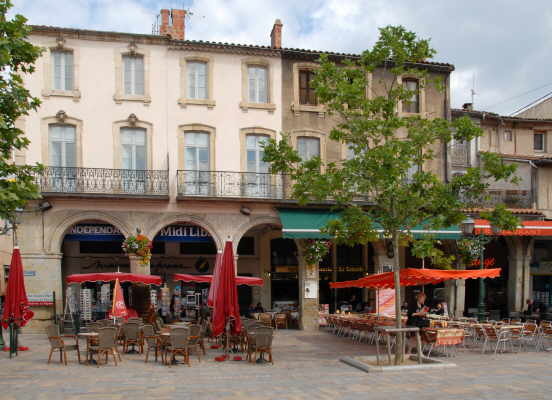 The extreme western part of Aude is consumed by the Pays du Lauragais, which centres of the town of Castelnaudary, arguably the cassoulet kingdom of the world. Castelnaudary is a typical French provincial town, but one that proclaims no distinctive merit (beyond its cuisine), yet is a great pleasure to explore, to have a relaxing coffee and a quick tour of the market to buy something for lunch. 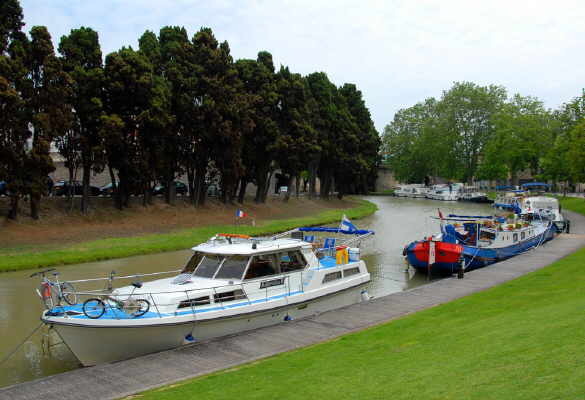 Today, the town is important to the surrounding farming communities of Lauragais in much the same way that it formerly proved of importance to trade along the Canal du Midi. The final segment of Aude’s jigsaw is the Pays Carcassonnais, the region of Minervois wines that spreads northwards into the rolling heights of the Montagne Noire. 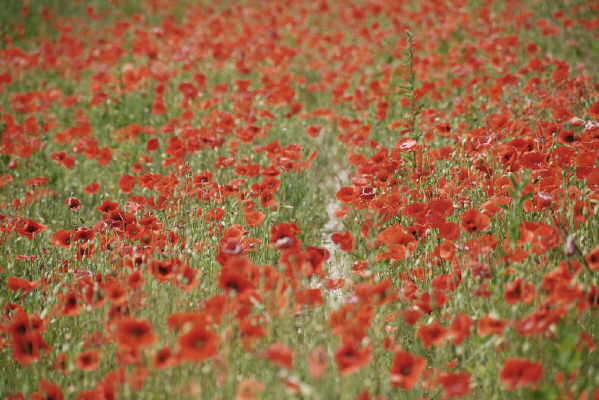 The scenery here is heavily rural, farmland, vineyards and cornfields dotted with poppies ripple in all directions once you quit the suburbs of Carcassonne. There are yet more ‘Cathar’ strongholds here, numerous small chateau, and isolated villages of some considerable age and simplistic beauty, attractions that appeal to those in search of peaceful retreats either for holiday purposes, or as permanent ‘away-from-it-all’ homes. And although the département of Aude is undoubtedly the setting for some of the most enjoyable wines produced in France, there is, of course, much more to the place. Mountains in the north; mountains in the south; the Mediterranean to the east, and a superb canal driven right through its middle. Throw in the superb heritage, the history, the mysteries and intrigue, the puckered landscape like crumpled paper, the heady scent of broom, sweet cicely and thyme, the villages and hamlets tucked neatly into hillsides, and Aude provides you with a vastly different perspective on all the good things of life in France. And when the sun shines (and even if it doesn’t), there is no more relaxing place to wile away hours, days, weeks…a lifetime, maybe. From Ouistreham (Caen) ferry port (Britanny Ferries) it is a drive of 615 miles to Carcassonne down the west side of France, mainly on autoroute, and 648 miles via Clermont-Ferrand and the more central A75 (but there are no toll charges on the A75 south of Clermont Ferrand, except for the Millau bridge (€5.60 in June 2008). The easiest route to drive is from Caen, as it’s almost all autoroute, or the equivalent. Although the distance can be covered in one long day, it’s best to stop off en route, maybe at La Rochelle or Niort, and take it rather more leisurely. This route passes Rennes and Nantes before heading down to Bordeaux, with fabulous river crossings on the way. From Bordeaux, you head south-east to Toulouse, with Carcassonne just an hour further on. All rail services throughout France can be arranged through RailEurope in the UK: Rail Europe House, 34 Tower View, Kings Hill, West Malling, Kent ME19 4ED. Telephone 08705 848 848. Comité Régional du Tourisme de Languedoc-Roussillon, 954 avenue Jean Mermoz, CS 79507, Montpellier cedex 2. Tel: 04 67 20 02 20. Maison de la Région Languedoc-Roussillon, 6 Cavendish Square, W1G 0PD LONDON. Tel: 020 707 9334. 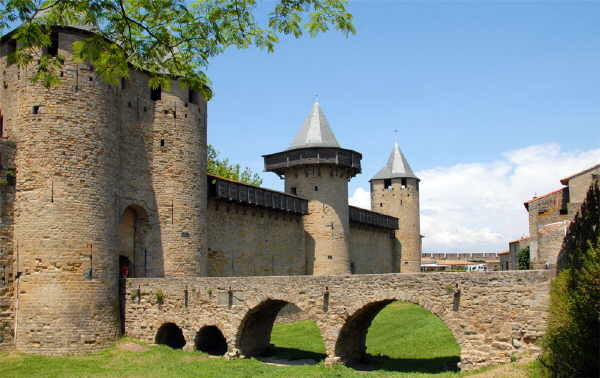 Comité Départemental du Tourisme de l’Aude, Chemin du Moulin de la Seigne, 11855 Carcassonne cedex 9: Tel: 04 68 11 66 00. 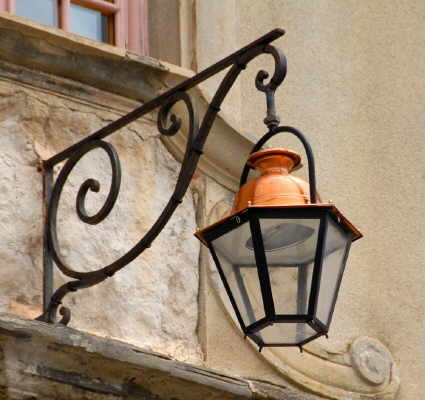 Hotel le Donjon, Cité Médiévale, 2 rue du Comte Roger, 11000 Carcassonne. Tel: 04 68 11 23 00. Hotel Mercure Porte de la Cité, 18 rue Camille Saint Saens, 11000 Carcassonne. Tel: 04 68 11 92 82. Restaurant Amarante, 11190 Rennes le Chateau. Tel: 04 68 74 29 98. Maison du Cassoulet, 6 rue du Grand Puits, 11000 Carcassone La Cité. Tel: 04 68 47 6 03.